(From left) Producer Melissa Tsuei, show host Tezarah Wilkins, and producer Tanikka Charrae Myers, the team behind “Who Taught You How to Drive? !”, a podcast that just won a Google/PRX podcast grant. When Tezarah Wilkins noticed that her road rage was getting to an all-time high, she turned to an unlikely solution. Wilkins, 36, a self-proclaimed podcast addict, said she thought starting a show about people’s driving habits would inspire more compassion for all those terrible drivers she was forced to share the road with. Welcome to the world of Who Taught You How to Drive? !, billed as interviews “with people who get around” that are so funny that one online reviewer said it caused “funeral tears.” It’s where nostalgia involves grandmothers driving over toes, where SEPTA buses are the sort of places where drugs could just fall in your lap, and where the word PPA is always bleeped out. (For real, except somehow only one person has talked about the P— so far.) The show also touches on more serious issues, with Wilkins opening each episode with a transportation headline, like news of the first Saudi Arabian women to get driver’s licenses. Tezarah Wilkins started a podcast about driving because her road rage had gotten to an all-time high. Her partner, Melissa Tsuei (right), and best friend, Tanikka Charrae Myers (left), help produce the show. "I have a lot of ideas," Wilkins said. "They keep me grounded." The podcast, which premiered its 14-episode season in July 2018, is currently getting a mega-boost from the new Google Podcasts creator program run by Public Radio Exchange (PRX). It was one of six podcasts chosen from thousands of applicants to get a $40,000 grant and participate in a 20-week training program featuring such big podcast names as Jenna Weiss-Berman, who produced Missing Richard Simmons and BuzzFeed’s Another Round. The program, whose inaugural class includes shows about the Filipino diaspora and queer Africans, aims to make podcasting more accessible and more diverse. Podcasting and public radio, like the film industry and the theater community, are overwhelmingly white. In 2015, Chenjerai Kumanyika, a Philly-based Rutgers professor and host of the podcast Uncivil, wrote an essay that sparked many discussions about whose voices are prized in public radio. The show is a “great example of an interview-style podcast with a distinctive voice,” said PRX training director Kerry Donahue in a statement, “and it helps a great deal that Tezarah Wilkins has a fabulous sense of humor.” While there’s lots of talk about highly produced, narrative-style podcasts, Donahue said it’s important not to overlook interview-style podcasts such as this one. For Wilkins, a photographer and producer who has largely worked behind the scenes on other people’s projects, the podcast was special because it was something she could do that was hers. It was her way of coming into her own as an artist. And she was committed to seeing the project through, even if she probably wasn’t going to make any money off it — which many people made sure to remind her about. “I was, like, ‘Yeah, I know, but ... it might be fun,’ ” she says in her signature deadpan. Fresh off the one-week intensive part of the training in Boston, where PRX is based, Wilkins, who grew up in North Philly, said one of the things she’s thinking about is figuring out who her audience is, and who she wants it to be. This question came up when producing an episode in the first season, where a guest said, “N— is dyin’ out here," talking about the violence and discrimination black people face while driving. 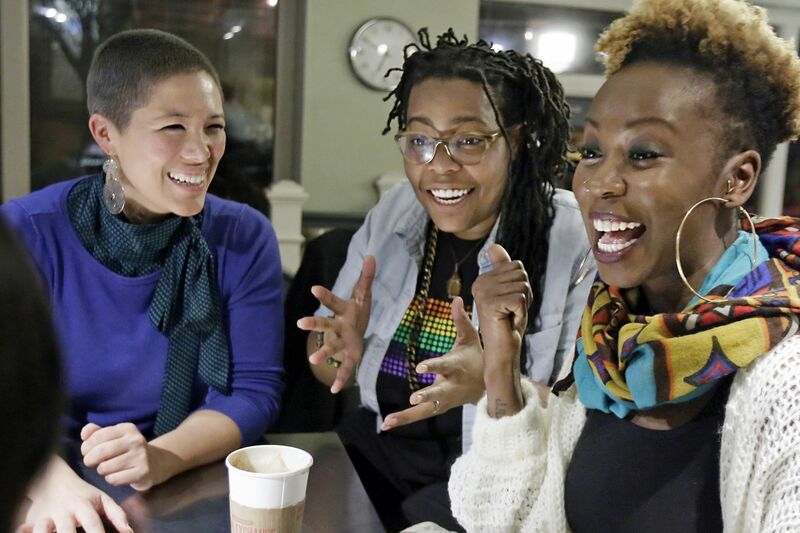 Wilkins spoke with her co-producers, partner Melissa Tsuei and best friend Tanikka Charraé Myers, about how to address the N-word. Should she bleep it out? Would it make some people uncomfortable? She wouldn’t say the N-word in front of, say, the executive director of an arts foundation where she worked, but what if that executive director was listening? Ultimately, Wilkins didn’t bleep it out. (“I don’t bleep anything else out. Except the PPA. Of course.”) It’s a part of the car culture for black people, she said, and it was something “that needed to be said ... something that needed to be heard." Like Wilkins, her co-producers, who help with marketing, logistics, and the creative process, work in a number of creative fields. Tsuei, 39, is a social worker who runs an Etsy vintage shop and writes, and Myers, 36, is a singer/songwriter who also designs clothes. It was Myers who bought Wilkins her first mic. Who taught you how to Segway?! The podcast is a decidedly DIY affair, with Wilkins recording the show in her and Tsuei’s dining room in Upper Darby, on what they describe as a noisy block, where they live with their dog that snores like a 100-year-old man (“There have been some challenges with quality,” says Wilkins), and teaching herself to edit through YouTube. The grant will allow her to dedicate more time to the show, she said. The team will return to Boston in June to broadcast the pilot of a second season. She hopes to widen her net of guests for seasons to come: not just drivers, but also more bikers and walkers, maybe someone who drives a Mister Softee truck or who runs one of those Segway tours around the city. And famous people. Famous people would be good.